The iSpecimen Marketplace is modeled after similar online consumer portals designed for one-stop shopping. 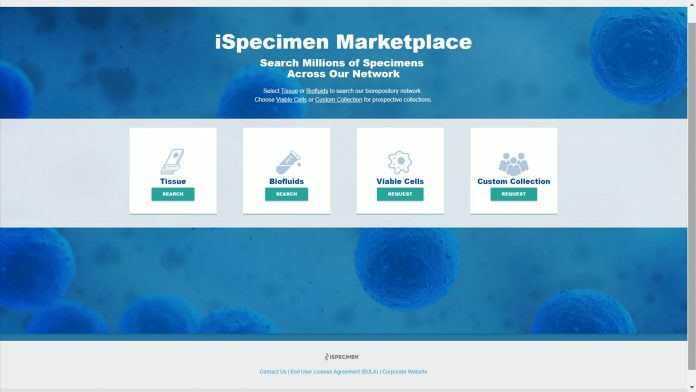 Human biospecimen marketplace iSpecimen, has launched an online platform called iSpecimen Marketplace with the intent of quickly connecting life sciences researchers in need of specific biosamples with the biobanks and clinical laboratories that have them. The searchable platform, which carries broad similarities to other consumer marketplaces like travel-oriented sites Travelocity and Kayak, provides a search platform for researchers to enter the type of sample they seek, then narrow it down to their specific parameters in order to identify the most relevant biospecimens available from the suppliers in the network. According to Christoper Ianelli, M.D., Ph.D., CEO of iSpecimen, the concept for the company arose in 2009 when he and others working in a clinical setting noticed that most tissue samples generated were discarded within days of their initial testing and collection. At launch, the iSpecimen Marketplace had an inventory from its supply partners of nearly one million biobanked specimens, including biofluids, solid tissue, and cells. The company anticipates adding “millions” of additional clinical remnants to the marketplace, as well as prospectivley collected research-use-only samples by the end of the year. All research-use-only samples available through iSpecimen are collected with patient consent as required by federal law, as well as institutional review board (IRB) oversight. For Amer Abouhamze, assistant director of the CTSI Biorepository at the University of Florida, participation in the Marketplace as a supplier helps it fulfill its mission of more broadly aiding the research community. His facility currently has more than 32,000 samples in various formats and is growing on a weekly basis. This growth is occurring despite being an active distributor of biospecimens, largely within the Florida area. Features of the iSpecimen Marketplace include automated fulfillment and procurement processes, offering a partner–facing web interface that directs specimen selection, packing, and shipping. Further, as a benefit of participation, iSpecimen partners can use the technology to gain insight into their own specimen availability as well as access specimens from across the network for their own their internal research needs.